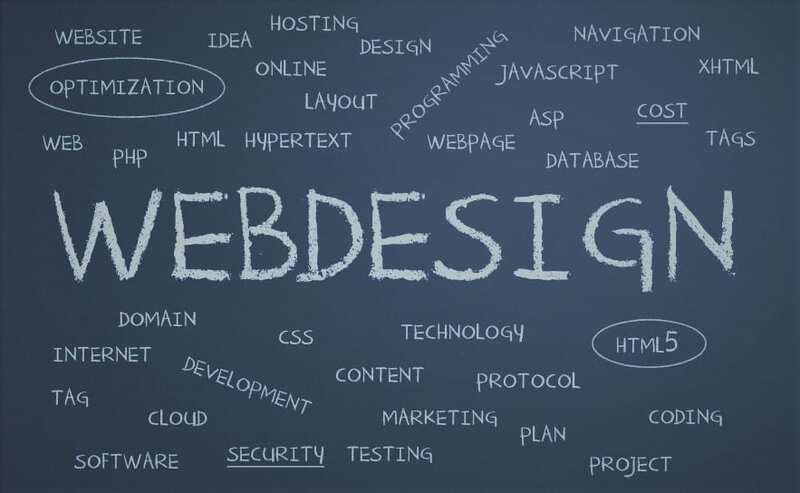 Website Design is the process of designing the front end of a website including writing mark up. It is a process of conceptualizing, planning and building a collection of electronic files that determine the layout, colors, text styles, structure, graphics, images and use of interactive features that deliver pages to site visitors. Design considerations vary greatly depending on the target audience for whom the website is being designed. How well we understand and how we interact with the site relies on the design of the website. Home Page design, the design that will help in SEO are a few of the factors our web designers keep in mind while designing a good looking and user-friendly website. Graphic Design is what most people think of when they think of design because it’s the easiest to observe. Graphic designers pick colors, choose images, design logos, and do other very visual tasks. This type of design is similar to what most people would consider ‘art’. Great graphic design means the website or software looks pretty. Layout: This is the way the graphics, ads, and text are arranged. In the web world, a key goal is to help the view find the information they seek at a glance. This includes maintaining the balance, consistency, and integrity of the design. Colour: The choice of colors depends on the purpose and clientele; it could be simple black-and-white to multi-colored design, which conveys the personality of a person or the brand of an organization, using web-safe colors. Graphics: Graphics include logos, photos, clip art or icons, all of which enhance the web design. For user-friendliness, these need to be placed appropriately, working with the color and content of the web page, while not making it too congested or slow to load. Fonts: The use of various fonts enhance a website design. Most web browsers can only read a select number of fonts, known as ‘web-safe fonts’. So our designers generally work within this widely accepted group. Superb Typography helps here; how we write our message is as important as what our message is. A website’s typography includes the spacing of texts, font association and contrasting. Content: Content and design can work together to enhance the message of the site through visuals and text. Written text should always be relevant and useful, so as not to confuse the reader and to give them what they want so that they remain on the site. Content should be optimized for search engines and be of a suitable length, incorporating relevant keywords. If graphic design is art, then User Interface Design is science. UI designers figure out how software and users interact with each other. When we submit a form, what happens? How are users notified of errors? Does the form go to a new page, or submit while staying on the current page? UI) design specifically pertains to the design of interactive elements, and as such lives almost exclusively in digital media, such as on a computer, tablet or smartphone. Interactive elements such as drop-down menus, form fields, clickable elements, animations, button styling, etc. are critical for UI designers. Even images with some kind of interactivity are UI, even when they incorporate static images. Great UI design means the software is easy to use. If we have to choose between great UI and great graphics, then we are of the opinion that a great UI is always more important than great graphics as ease of use is more critical than just great look & feel. However, to achieve the optimal results both UI and graphics should go hand in hand and should complement each other. User experience design is different from both UI and graphic design in that it focuses on the logic and structure of the elements we actually see and interact with. UX primarily takes place in two distinct phases: research and validation. During the research phase, the UX designers use a variety of tools and methods to better understand their intended users. Competitive analysis, user interviews, persona creation, wireframing, heuristic analysis and journey flows are involved. After the product has been launched, then comes validation. Now, UX designers perform usability/pain point analysis to determine if the product is producing the expected result. If not then refinements and revisions are made based on user data, to make the end result better and more efficient. Our designer’s design world class responsive websites which can be accessed from any device irrespective of screen size; the web page will perfectly fit in and the design. Website is a collection of related web pages that may contain text, images, audio and video. The first page of a website is called home page. Each website has specific internet address (URL) that we need to enter in our browser to access a website. Website is hosted on one or more servers. Website Development means to get a website ready for the world wide web. 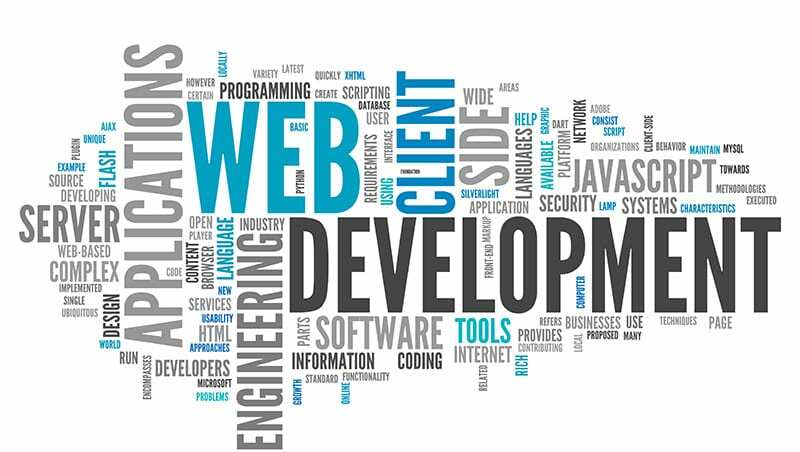 Web development can range from the most uncomplicated single page plain text static website to the most complex of web-based internet applications, electronic businesses, and social media infrastructure. Does the logo re-size and re-scale correctly? Our logo is the pinnacle of our brand. It should look great on all devices to best represent our business and start the conversation with our clients. If our logo looks blurry, too big, too small, cut off, or broken in any way; we need to fix it immediately. Are icons blurry rather than crisp and retina ready? If icons are clear on a laptop but appear blurry when viewed on a mobile phone, it’s a sign that mobile site is unable to handle responsive images. Since laptops, tablets and mobile devices come in multiple resolutions, we need to get the image formatting right. Our web team is capable of deploying and managing multiple resolutions across screens. Do the images scale correctly with content? When we move from desktop to mobile sometimes our images look huge or they appear to be cut off. The mobile experience is a fluid environment and images designed for desktop consumption and assigned a fixed position on the site wreak havoc on mobile site. Does the site perfectly fit in across devices, screens or orientations? Sites must be designed to re-flow at certain dimensions i.e. when a user turns and operates the device horizontally. For desktop 1024 pixels and up and for phone 768 pixels and 320 pixels are normal dimensions. We can also include 480 pixels as an in-between dimension that allows a responsive site to re-flow naturally and adjust itself to the size of the device/orientation. Sites should perfectly fit in to various screen sizes for ideal user experience rather than the site looking small on laptops/desktops and big on mobile devices/tablets. Resolutions and aspect ration must be kept in mind. Can content be inserted at one go for multiple screens? If content is inserted for a mobile version in addition to desktop site, then the site is not fully responsive page. Static Website’s web pages are coded in HTML. The codes are fixed for each page so the information contained in the page does not change. Dynamic website is a collection of dynamic web pages whose content changes dynamically. It accesses content from a database or Content Management System (CMS). Therefore, when we alter or update the content of the database, the content of the website is also altered or updated. Websites contain fixed number of pages. Prebuilt content is same every time the page is loaded. Websites create web pages dynamically. Content is generated quickly and changes regularly. Websites directly run on browser and do not require other server application language. Static websites can be created from HTML and CSS. Websites load quickly on client browser because they have only some markup contents. Websites run the application on server and the output is displayed on webpage/s. This uses server side languages such as PHP,SERVLET, JSP and ASP.NET etc. for developing websites. Sites take some time to load on client browser because the request is processed on the server side which creates content dynamically. Theme of the website and content of the webpages are fixed. This sends exactly the same response for every request. This never uses database connectivity. Design and content may change on run time. This generates different HTML for each request. Sites deal with database and generate the contents dynamically using database queries. The content is only changed when someone publishes and updates the file (sends it to the web server). If we want to change the page content then we have to upload that page on server. Static websites are highly secure than dynamic sites because they have a half duplex approach. So only one way communication is possible i.e. server to client. The page contains ‘server-side’ code which allows the server to generate unique content when the page is loaded. It is possible to change the page content using server application and it is not required to upload the page on server. Dynamic sites are less secure because they have a full duplex approach. So both side communications is possible. So user can possibly change the server data. Flexibility is the main advantage of static websites. Every page can be different if desired, to match the layout of different content. This allows theming. Static websites are easy to develop. Content Management System (CMS) is the main advantage of dynamic websites, an interface which allows the client to input and manage data via a web-based series of administration pages. Compared to static websites, dynamic websites need more effort to create, manage,test and maintain security of application and database. We develop the whole range of responsive websites. The websites so designed are state of the art and are developed adopting the latest digital technologies. Mobile Applications (Apps) are software that can be downloaded to and accessed directly from a smartphone, tablet or other mobile devices such as a music player. App Development is basically the process of developing an application for these mobile devices. These applications can be pre-installed on the phones while manufacturing or can also be accessed through server side or client side processing to provide an application like experience within a web browser. Front-end development tools, as well as back-end servers, are required to develop an app and deploy it in a mobile environment. Mobile User Interface is essential and considers all constraints, context, hardware, screen, mobility, input, output, etc as guidelines for design. Native apps are exclusively developed for a single mobile operating system, therefore they are ‘native’ for a particular platform or device. App built for systems like iOS, Android, Windows phone, Symbian, Blackberry can not be used on a platform or device other than their own. For example, we won’t be able to use Android app on iPhone or an iOS app on Samsung. Main advantage of native apps are their high performance and that they ensure good user experience as developers use native device UI. 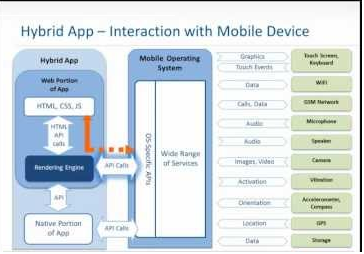 Further an access to a wide range of APIs puts no limitation on app usage. Native applications are accessible from app stores of their kind. 2. Hybrid apps for all platforms altogether with Xamarin, React Native, Ionic, Angular Mobile Sencha Touch, etc. Hybrid multi-platform apps are fast and relatively easy to develop vis-a-vis native ads. Single code base for all platforms ensures low-cost maintenance and smooth updates. Widely used APIs, like gyroscope, accelerometer, geolocation are available. Web applications require a minimum of device memory, as a rule. As all personal databases are saved on a server, users can get access from any device whenever there is a internet connection. That is why the use of web apps with poor connection would result in a bad user experience. Access is limited only to a few APIs for developers, such as geolocation and few others. Apps content is only a wrapper on the used device while most of data is loaded from a server. Performance is linked to browser work and network connection. Usually higher than hybrid or web, if apps are developed for multiple platforms. Commonly low cost, but require high skills for hybrid tools. The lowest cost due to single code base. Native code has wide access to device functionality, while content, structure and visual elements are also stored in device memory ready for instant use. Apps content is only a wrapper on the used device while most of data should be loaded from a server. Performance is inextricably linked due to browser work and network connection. App stores allow some of marketing benefits such as rankings and feature placements while they have their own requirements and restrictions. There are no store restriction to launch, but there is also no app store benefits. Both apps may have content in-app purchases, ads, and app purchase itself. However, app stores take fee – around 30% from all purchase actions, plus there is initial fee to deploy an app in the app store. Monetization is mostly provided via advertisements and/or subscriptions. According to Flurry analysis, users spend up to 86% of their mobile time using native or hybrid apps. Even if we exclude games from rating, the time spent is pegged at 54%. 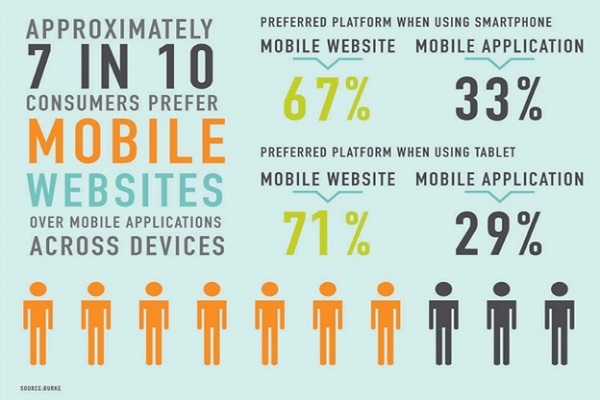 Users spend only up to 14% of time on mobile websites. Native platform code has wide access to any device APIs. Some APIs benefits are close to native apps. Only some of device APIs may be used such as geolocation. Apps developed with highly familiar and original UI to native OS. Even the best of apps can’t give to a user a fully native experience since these apps are in accordance with cross-platform UI and UX design. Code for one platform usually can’t be used for another. Most of hybrid codebase tools can be ported to major platforms. Browser and net performance matter here. Maintenance of app is in direct coorelation to the number of platforms it is developed for. Mostly since only one codebase is to be maintained or updated, all actions are much more easy and fast. Applications that are developed for single platforms Applications that need to be distributed as multi-platform or cross-platform. Applications with limited terms, resources or funds. Apps with wide requirements due to limited capabilities of hybrid or web. Apps developed for App Stores. Apps developed for App Stores. Apps that need best native UI or best graphic animation. There are 33 categories of apps in Google Play and 24 categories in Apple’s App Store. 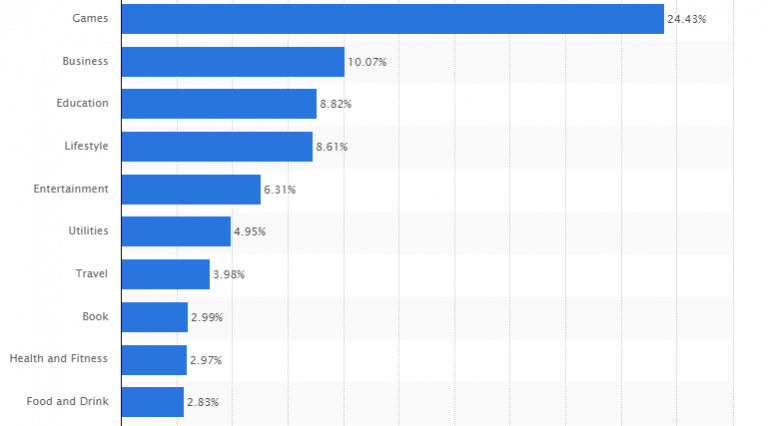 However, there are just 7 app categories that have managed to reach more than 3% of users, according to Statistica research. Further the below chart clearly indicates the purposes for which users are using mobile apps. Other than playing games, users mainly use mobile apps for business, education, lifestyle, entertainment, utilities, travel, health & fitness and food & drinks. 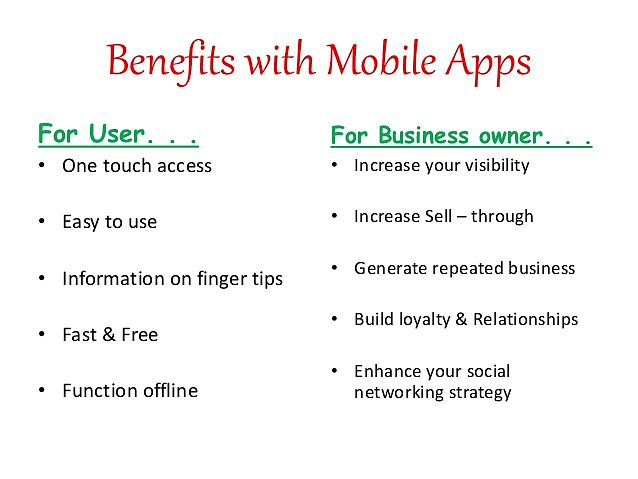 Mobile apps developed by us are high on functionality and utility. We also understand that space is at a premium here. We design & develop state of the art websites and mobile apps as required by our esteemed clients. Why think alone? If we can discuss?